LAKE LOUISE, ALBERTA- Canada – Enjoy the experience of a lifetime on our traditional Canadian Rockies sleigh ride tours! We’ll show you the very best of Banff sightseeing as you soar through the stunning backcountry on our horse-drawn sleds. Don’t miss this great adventure on your next Canadian Rockies vacation! Imagine back to a time – not so long ago – when all travel in wintertime was either on snowshoes, rough wooden skis or, even more commonly, in a sleek sleigh behind a team of horses. It’s no mistake that one of the most enduring Christmas songs takes all ages back to an era when winter travel meant dashing through the snow, enjoying fresh air and time with those you love all cuddled up in a horse drawn sleigh. Brewster Adventures brings that Christmas card image to life at Lake Louise, with the winter schedule of sleigh rides that follow the lakeside trail beneath Victoria Glacier. You’ll enjoy spectacular views of the Ice Falls at the end of the lake by day or the glow of the Chateau on evening rides. There is no better way to spend time together, drinking in the beauty of sparkling snow and blue sky, than bundled together in a sleigh. Take your family gathering or holiday party outdoors at Lake Louise, with private sleigh ride bookings available for groups, romantic two-seat cutter rides, or regularly scheduled sleigh rides seven days a week. Evening rides are also available every day except Sundays, when you can enjoy the starlit sky and the beauty of a quiet Rocky Mountain night. A sleigh ride in the mountains – whether you’re humming Jingle Bells or not – will take you back to simpler times, when families and friends enjoyed each other’s company, breathed in lots of healthy fresh air, and celebrated a special time of year. Our outstanding Lake Louise sleigh tours will provide you with tons of memories to cherish for years to come. This is a must-do Banff winter activity for sue. No Canadian Rockies vacation is complete without dashing through the snow on a horse-drawn sleigh! Returning to Banff and Lake Louise during the summer? Be sure to check out rafting in Banff and the Kananaskis River! For great rafting in Jasper check out JasperRafting.org! Watch this cool video from Brewster Adventures! 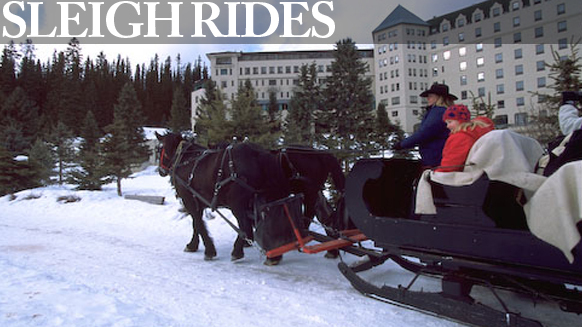 Our experienced Lake Louise sleigh ride guides have your safety in mind at all times. To ensure an enjoyable Canadian Rockies experience for you and your family, make sure to wear extra layers and be prepared for cold weather conditions. Weather can change on a dime, so make sure to pack rain and snow gear.